Durango Fire & Rescue Authority firefighters load the driver of a pickup into an ambulance Monday afternoon after her northbound truck crossed into the southbound lane of U.S. Highway 550 colliding with a dump truck on Farmington Hill. 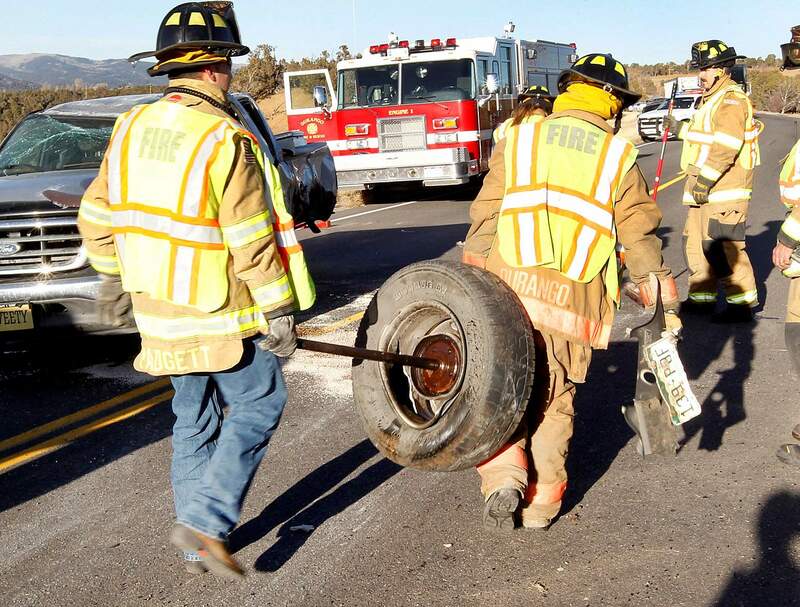 Durango Fire & Rescue Authority firefighters carry a rear wheel from a pickup after it collided with a dump truck on U.S. Highway 550 south of Farmington Hill on Monday afternoon. Jacob Tuck, the driver of the dump truck hit by the pickup, inspects his rig on U.S. Highway 550 south of Farmington Hill on Monday afternoon. 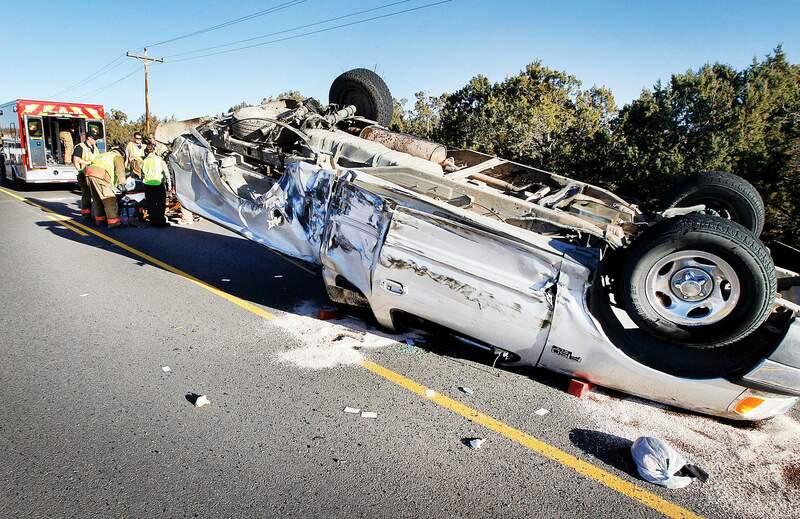 A New Mexico woman suffered minor injuries Monday after rolling a Ford F-150 near the top of Farmington Hill. 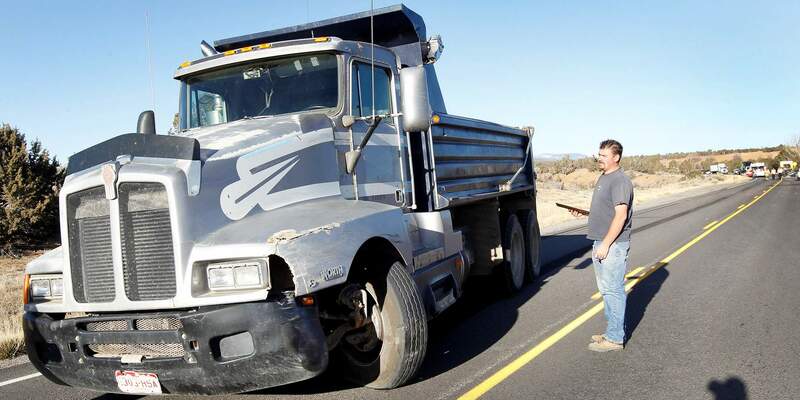 The crash occurred about 2:55 p.m. near mile marker 15 of U.S. Highway 550 when the woman driving northbound veered into oncoming traffic and hit a dump truck full of gravel. The Ford pickup rolled at least 1½ times and came to rest on its top in the road, said Rusty Sanchez, a trooper with the Colorado State Patrol. Witnesses said the woman crawled out of the back of the vehicle. It is unclear why the woman was in the southbound lane, said Nate Reid, a trooper with the state patrol. She crossed the center line in a no-passing zone. Jacob Tuck, who was driving the gravel truck, said the woman wasnt passing another car when she entered his lane. She looked like she was trying to commit suicide, the 23-year-old said. Tuck said he slammed on his brakes and hit the air horn, and the woman swerved away from him just as he hit her. The front drivers side of the dump truck hit the F-150. Tuck emerged from the accident unharmed. Both lanes on Highway 550 were closed for about an hour and traffic was diverted onto County Road 220. The 43-year-old woman, who has not yet been identified, was taken to Mercy Regional Medical Center, Reid said.